"This charming collection of children's folk songs was intended to teach kids to appreciate nature, particularly natural creatures that are often regarded by adults with fear and loathing. The songs... extol the virtues of spiders, lizards, snakes, bees, worms -- virtually every critter you'd expect to find on a list of America's Least Wanted... The songs are simple and pretty, containing memorable melodies and attractive acoustic guitar and harmonica arrangements. 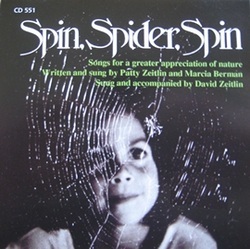 Spin, Spider, Spin was released in 1974 and seems rooted in environmentally concerned, folk music loving hippie culture. But it doesn't seem dated and should carry considerable appeal for parents looking for an alternative to Pokemon and Disney products."